With the Nehalem architecture Intel presents the next step in the evolution of microprocessors. 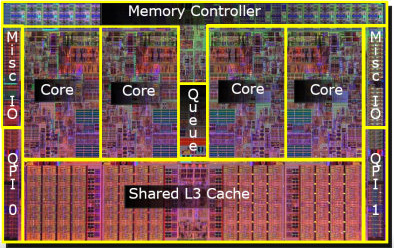 Officially the now call this 731 million transistors heavy derivate Core i7. On big step was to integrate the memory controller into the CPU. Further Nehalem again comes with Hyperthreading which we still know from the Pentium 4 and a heavily overworked power management which now can even shut down single cores to save energy. These are only two of the new features Nehalem is provided with. First of all we thank Intel for providing us with the test samples. On the following pages we will discuss the features of the Nehalem architecture as well as its performance. L3 Cache 8 MB shared n. A. n. A. The Front-Side-Bus-architecuture on which Intles Core 2 CPUs and older ones are base might be sufficient for notebooks but high performance desktops, workstations and servers demand for higher bandwidths. Notebooks therefore access one or two cores and the are cost and energy sensitive also the need low latency for a single task. On principle desktop systems are similar to notebook systems but they need to be able to handle extreme bandwidth when it comes to discrete graphic solutions. Servers can access a nearly unlimited number of CPUs and they also need to handle many different tasks. Therefore they require low latency and massive bandwidth. With Nehalem, Intel designed a flexible, modular and highly scalable CPU which comes up to all these demands. 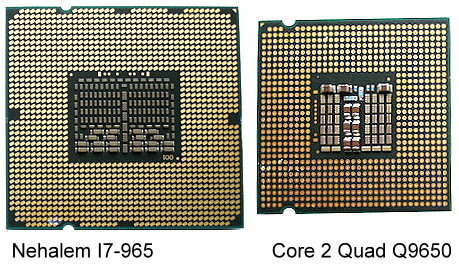 Nehalem is Intels first monolithic quad core CPU which comes with an integrated last level cache. A central queue connects the different cores with eachother and also the uncore region where the L3-cache, the integrated memory controller and the QPI links are located. Through integrating the memory controller on to the CPU there is no more need of a Front-Side-Bus. Instead there now are QPI links (Quick Path Interconnect). Summarized QPI is a packet based point to point connection which provides high bandwidth and low latency. 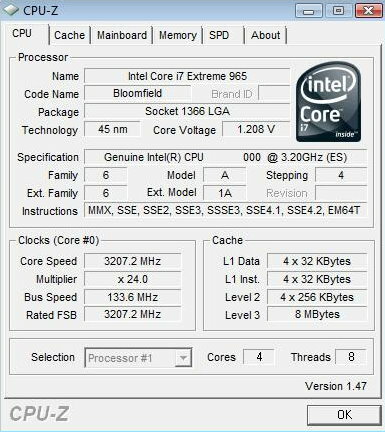 Best case up to 6.4 GT/s are possible. Every link is implmented as a 20 bit wide interface. QPI packets are 80 bit long and will be transmitted in 4 to 16 cycles. 16 of 80 bit are reserved for flow-control and CRC. The other 64 bit handle data. Every link is able to transfer 12.8 GB/s and because of the fact that QPI links are bi-directional 25.6 GB/s can be transferred. Nehalem will scale with the number of QPI links which will be determined by the targeted marketsegment. Nehalems integrated memory controller supports tripple channel DDR3 which does 1.33 GT/s. The maximum bandwidth therefore is 32 GB/s. Every controller can act independently. This has a positive impact on the overall performance. To profit of the four times higher bandwidth every core supports now up to ten data cache misses and 16 total outstanding misses. A Core 2 on the other hand supports 8 data cache misses and 14 total misses in-flight. Also the integrated memory controller improves memory latency substantially. In example Nehalem proviedes 60 ns latency compared to 100 ns on Harpertown. Also the instruciton set has been extended. SSE4.2 therefore now supports string comparsion, a CRC instruction as well as a popcount. Demonstrations under optimal conditions showed a performance increase 6 to eighteen times but in every day applications the increase will be much smaller. Much more important is the return to simultaneous multithreading (SMT). Intel first implemented the on a 130 nm Pentium 4. SMT demands a lot of bandwidth to deploy its potential because it generates substantially more outstanding misses. Also the validation is very complex and requires a design which is basically conceived for SMT. Further SMT is a very elegant way to get more performance out of one core because it es very energy efficient. Nehalem also features changes in the TLB hierarchy wich come hand in hand with the changes in the cache hierarchy. Nehalem now has a true two level TLB hierarchy which can be allocated dynamically between threads. The first level TLB serves all memory acceses and contains 64 entries for 4 KB pages as well as 32 entries for 2M / 4M pages whereas it keeps four way associativity. Further Nehalem contains a second level unified TLB with 512 entries for small pages which again kepps the four way associativity. To allocate the whole cache every core has 576 entries for small pages and 2304 for the whole chip. The number of TLB entries makes the translation of 9216 KB possible which is more than enough for the 8 MB L3-Cache Nahlem comes with. Nehalems TLB can also access VPIDs (Virtual Processor ID). Every TLB entry caches the translation of a physical to a virtual address. The translation is specific to a given process and virtual machine. Earlier Intel CPUs needed to flush the TLB whenever it was switched between virtualized guest and host instance. Intel estimates that the latency for a VM round trip is 40 percent compared to Merom (65 nm Core 2). A further improvement referring to virtualisation can be found when we look at the extended page tables. They are now able to eliminate many VM transitions and not only reduce the latency like VPID does. Earlier Intel designs needed a hypervisor which was handling page faults. Now the page tables can be simply compared which saves many unnecessary VM exits. 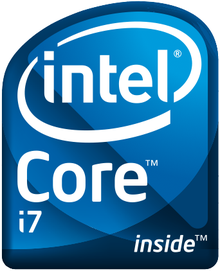 Compared to its predecessors the Core i7 comes with a power control unit (PCU) which is able to shut down the cores. The advantage is obvious: leakage in indle state can be reduced and therefore also energy comsumption. Futher the PCU - which by the way contains as many transistors as a whole 486 CPU - can also deactivate the uncore regions which reduces the power consumption even more. On principle the following three circumstances generate dissipation power: processes which run a high frequency cause leakage, high frequency needs high performance referring to golbal clock distribution as well as the logic and the local clock distribution are responsible for the power consumption of a CPU. Power consumption can be minimized when the operating system tells the CPU that no task is ready for execution. The CPU now goes in to idle mode or a so called C-State. There it waits for futher instructions. The integrated power gate gives the option to reduce the power consumption in idle state to near zero watts. This can also happen for every core independantly. Further also the memory subsystem draws less power because the memory clocks can be reduced during requests and low load. Even the QPI links draw less power because they are less active. A similar behaviour is showed by the PCI Express links. Summarized one can say that the power consumption of the whole platform is going to be lower. At this point we start with an example: When the operating system only needs the computing power of one core because a single task applications needs to be executed as fast as possible Power Gate can shut down three of the four cores and overvolt/overclock one single core within the same thermal envelope. This feature Intel calls Turbo Mode. This feature is thanks to the Power Gate again very flexible so every single core, two, three or four of them can be overvolted/overclocked simultaneously. In other words Turbo mode extends Intels already well known SpeedStep technology by P-states (power states) which the operating system can ask for when it needs more computing power. 3DMarkVantage not only profits from the overworked architecture it does so also because it is optimized to run in an environment with eight cores. The performance advantage for the Nehalem in this case is 24 percent. In SuperPi 1M Core i7 965 performs about 14 percent better then a Q9650. If one calculates Pi to 32 million digits Nehalem performs 26 percent better. In SiSoftSandra Core i7 is up to 72 percent faster than its predecessor. Even more drastic is the performance increase in memory bandwidth: A massive 248 percent. Also in the multimedia benchmarks Nehalem is up to 37 percent faster. Datacompression performs on a Nehalem system up to 53 percent better. In both POV-Ray benchmarks Core i7 965 is at least 60 percent faster than Q9650 and in Cinebench it still is 47 percent. With Nehalem Intel shows a once in a decade overwork of their CPU architecture. Compared to other competitors their integration of the memory controller into the CPU as well as on die routing comes a little late. It seems that Intel was able to learn from the faults of AMD and Alpha which did this step earlier and the result Intel now presents can really convince. Further Nehalem is the first major overhaul of Core 2 microarchitecture which was introduced in June 2006. By creating a scalable and flixible basis for the next ten years Intels Hillsboro developer teams seems to have done a remarkable job. Overall Intel seems to have improved, accelerated or extended nearly every single unit with Core i7 except the functional units. Most of all changes one can find in the memory pipeling. The biggest modification in the cores is the implementation of SMT of which in future nearly every single application will profit. If we concentrate on performance figures we are able to state that Nehalem is in none of the tests slower than its predecessor. The span goes from 13 percent in F.E.A.R. to 248 percent in SiSoftSandras memory bandwidth test. It is a matter of fact that bandwidth intense benchmarks profit most because of the now integrated memory interface. As a further example POV-Ray performs more then 50 percent faster than an already fast Core 2. An interesting feature is Power Gate. It is not only able to deactivate every single core independently it can also overclock them. It does so if a single thread application or another one which can use the power of two or three cores needs more performance to be executed more quickly. At this point we only wait for the final prices which we will present as soon as possible.